The little village of Maketu is the site of one of the earliest Maori settlements in Aeotearoa (New Zealand). Many towns of the East Cape region of our district share these Maori cultural roots, as do most communities in our district. The Coromandel Peninsula towns of Thames and Paeroa witnessed the gold rush fever of the 19th century. Tourism flouishes in Rotorua, Mt Mauganui, Hawkes Bay, and Taupo. Agriculture abounds from the kiwifruit orchards of the Bay of Plenty, to the dairy farms of the Waikato, to the vineyards of Hawke's Bay, to the vast forests of the central region. Our largest city Hamilton is a hub of technology and higher education, and New Zealand's largest port, Tauranga, drives the economy of our entire region. And in every one of the areas you will find Rotary clubs that serve their local communities as well as Rotary's global mission. We are 52 clubs powered by nearly 1,800 Rotarians. 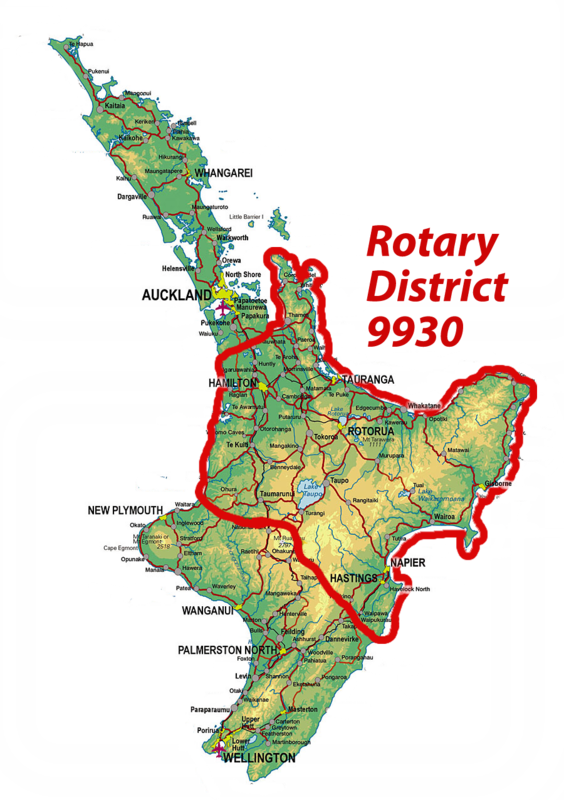 Take time to explore District 9930, and see how Rotary can "Be The Inspiration".